Every page of our site uses a secure (HTTPS) connection. This means that your personal information is encrypted before being sent back and forth between your computer and our site — to ensure your information is protected at all times. It makes sure that your information is being sent to us and not to anyone else, and it also means that your navigation history is kept private. You can verify that you’re on a secure server by checking the address at the top of your browser begins with https://. Our site has an EV certificate, which means that the certificate authority (in our case, Comodo) has done extensive validation of our company’s identity, according to set verification criteria. 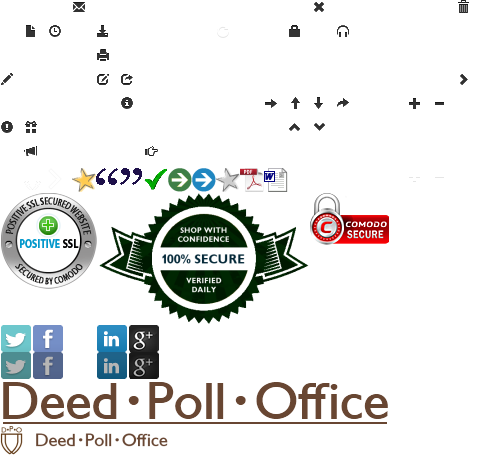 In short, this means that the certificate not only tells you that you’re dealing with the website “deedpolloffice.com”, but that you’re dealing with the company “Deed Poll Office Ltd”. As a result, you should be able to see the legal name of our company (“Deed Poll Office Ltd”) in a green bar, near the top of your browser. It’s not enough just to have a “secure” connection and that’s it. A website server has to be set up in a certain way, to be as secure as possible, and it has to be constantly maintained and upgraded to stay that way. 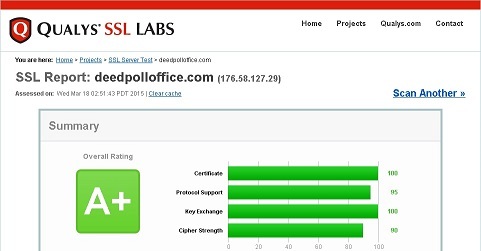 As part of our security policy, we’re committed to making sure our server always has at least an A grade as rated by Qualys SSL Labs — and you can check this for yourself. In short, this means that we will not sell or pass on your information to anyone else, or use it for any purpose other than to prepare your deed poll documentation and our own administration. We will keep your personal data for 56 days after we have processed your application, except your e‑mail address (which we keep for 112 days).